Originally uploaded by Chris Schuette. Sometimes the picture is just too weird. 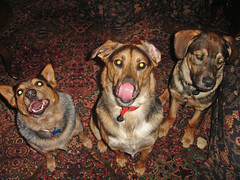 That’s Indie in the middle, Bear on the right, and their friend, Aussie on the left. The Hounds of Hell, they ain’t!